IT’S CLEANER, GREENER AND CHEAPER. LPG Autogas is by far the most widely available environmentally friendly alternative fuel with over 1400 refuelling sites throughout the UK, most of which are on petrol forecourts. 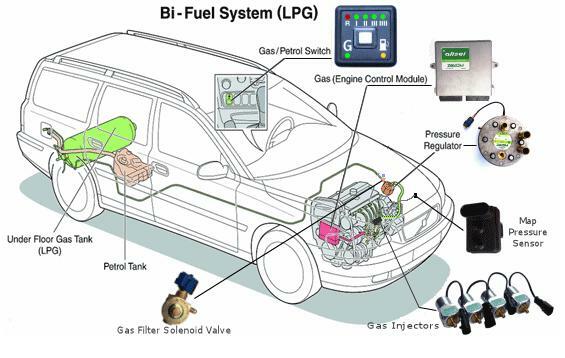 Recent independent tests have also shown that LPG has the best environmental record compared with petrol and diesel. Drivers and fleet operators save money each year by switching to LPG and this includes cars, vans and taxis whilst benefiting the environment. Driving an LPG vehicle is safe, easy and best of all, much cheaper than driving a petrol or diesel model. In the UK, LPG costs around 50 pence per litre cheaper than petrol and diesel. Although the miles per gallon when running on LPG is usually around 20% less than petrol, because it is so much cheaper to buy, significant savings in fuel costs can be made – see how much money you can save by using The Savings Calculator. You can reduce your fuel consumption, save money and reduce your impact on the environment by following a few basic driving rules. Check your tyre pressure every month – under inflated tyres can increase fuel consumption by up to 4%. Service your vehicle and check the oil level regularly – correctly maintained cars can operate more efficiently and help reduce fuel consumption and CO2 emissions. Remove unnecessary weight from your vehicle – the heavier the vehicle, the harder the engine has to work and the more fuel it will consume. Close windows especially at high speeds and remove roof boxes, racks or bike carriers when not in use – reducing wind resistance will reduce your fuel consumption and can cut emissions by up to 10%. Use air conditioning only when necessary – this can reduce fuel consumption and emissions by up to 5%. Start driving as soon as possible after starting the engine and turn off the engine when stationary for more than one minute – modern engines are designed to enable you to just get in and go, thus reducing fuel consumption. Drive at a reasonable and consistent speed – driving at high speeds significantly increases fuel consumption and every time you accelerate or brake hard your engine uses more fuel and produces more CO2. When accelerating change up gears as early as possible – higher gears are more economical for fuel consumption. Try to anticipate traffic flow – look ahead as far as possible to help avoid unnecessary braking. Consider car sharing for work or leisure. Source: The European Petroleum Industry and the European Commission.